Tasmanian Government businesses offered a diverse range of services ranging from essential utilities such as transport and electricity, to irrigation and financial services. Government businesses were expected to deliver services at the lowest sustainable cost, while also providing an appropriate financial return to the government in the form of dividends, income tax equivalents and guarantee fees. Government businesses operated outside the Public Account, principally on the basis of funds derived through operations and generally had no direct impact on Budget expenditure except in circumstances where funding for Community Service Obligations (CSOs) was received, or payment was received for services provided to government agencies. 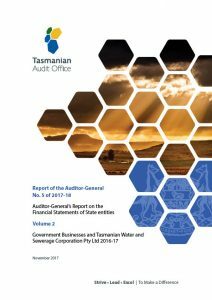 The Report contains the results from our financial audits of 17 entities and two subsidiaries in the government business sector, as listed below, comprising six Government Business Enterprises (GBE’s), eight State-Owned Companies (SOC’s), two other Public Non-Financial Corporations (PNFC) and Tasmanian Water and Sewerage Corporation Pty Ltd which was owned by councils. For the purpose of the Report, entities covered in aggregate will be referred to as Government businesses. A guide to using our Reports can be found here. Summarised statement of the findings within the report, for members of the media. Presentation made to members of Parliament shortly after tabling.